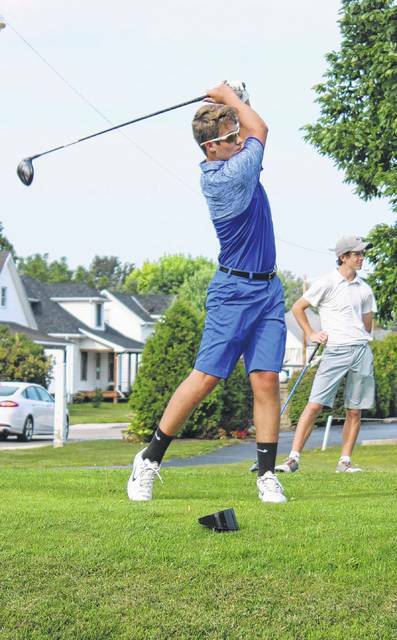 The Washington Blue Lion golf team hosted Grandview Heights for a non-league match Monday, Aug. 21 at The Greens. Grandview won the match, 3-1. Rose and Tyler Rood both shot scores of 47. Brock Morris shot a 48 and Gabe Arazo a 50; Brice Cartwright shot a 52 and Sam Shaffer, a 60. The Blue Lions will host Hillsboro in a Frontier Athletic Conference match Thursday at 4 p.m. at The Greens. Washington’s Brock Morris tees off during a match play round against Grandview Monday, Aug. 21, 2017 at The Greens.